I feel like party invites need to be resurrected, I spent my childhood dutifully filling out Strawberry Shortcake invites to send to my favourite classmates but the minute I hit my teenage years I stopped. Sure a Facebook invite is convenient but nothing beats the little spark of excitement you get when you open an envelope inviting you to a good time! To mark the event, I decided to make these invites for my birthday party. It took me about 2 hours to make 20 so I wouldn't recommend if you had loads to do but when dealing with small numbers you have plenty of scope to create something really special. All the steps are below. Step 1. Cut two lengths of net 3cm wide and 50cm long. Place on top of each other and stitch together forming a tube about 0.5cm from either side. Step 2. 1cm from the end stitch a row closing the tube at one end. Using a funnel add your sequins, I found it easier to add 3 or 4 generous pinches and work them down the tube as I needed them. 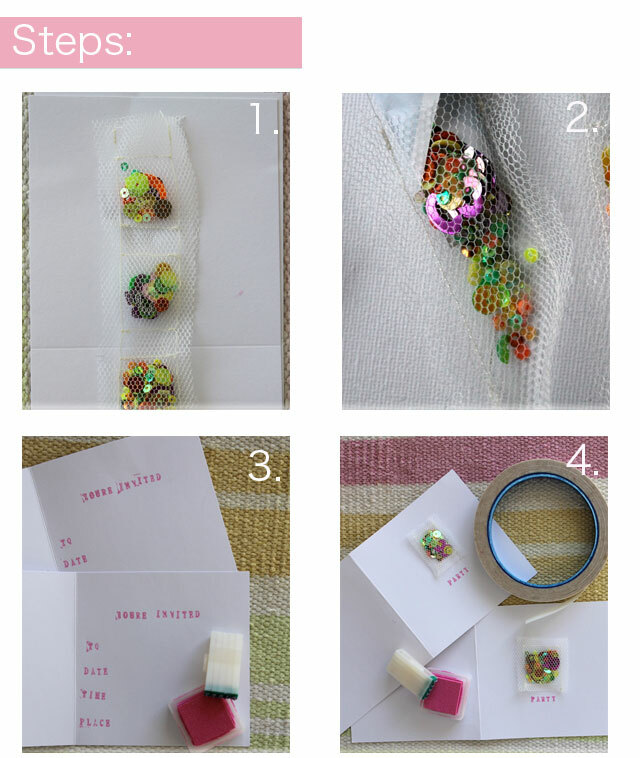 Work a few sequins down to the very end and then stitch a line to close the tube forming a little packet of sequins. Leave a 1cm gap stitch another row and the repeat the above steps creating a row of little sequin squares. Step 3. 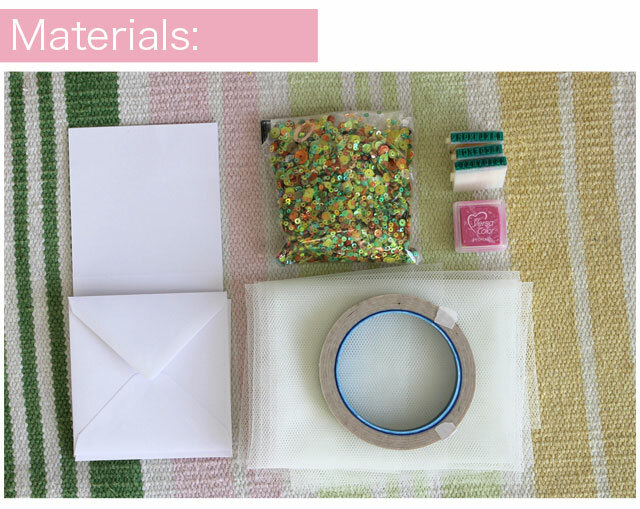 Taking you blank card, stamps and ink pad, print the inside of you invite. You might want to buy two of these stamps kits as they only come with one set of letters and it gets a bit annoying if you have two of the same letters in your word! Step 4. Cut your sequin squares from the row, neatening any edges if needed. Stick to the front of your card using double sided tape. 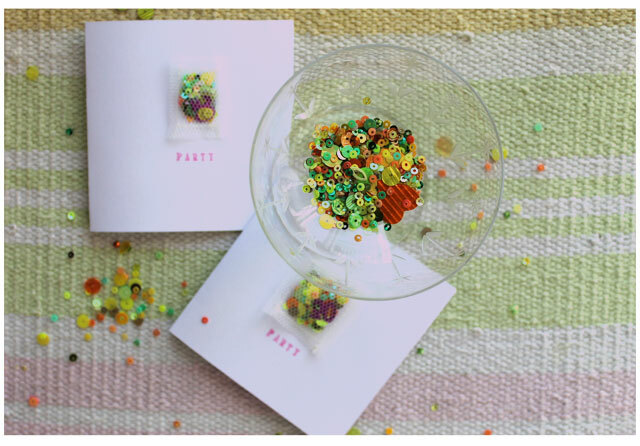 Print the front of the card and leave to dry for a few minutes before you write the party information on the inside. Ahh thanks! Poundland does the best sequins needless to say I have them in all colours ! These are so great! I love real invitations. Makes something feel like more of an occasion, but I only really get them for weddings, these days. 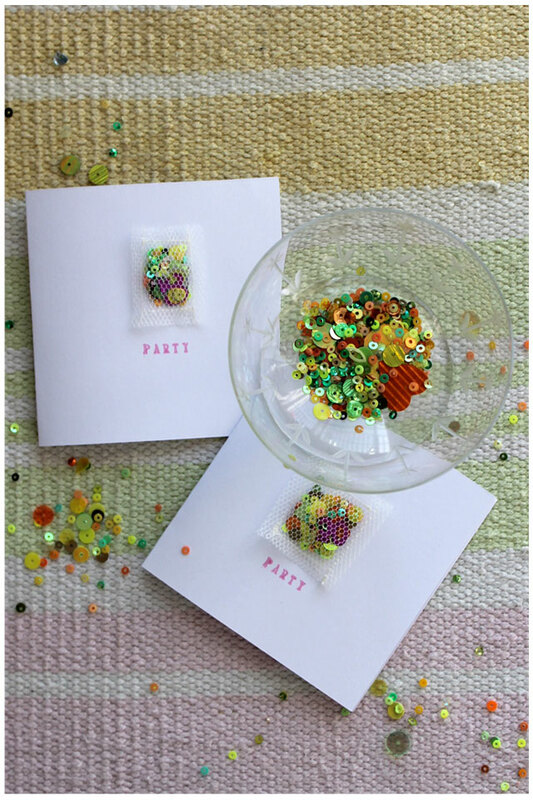 So these are the confetti/glitter invites you tweeted about! Even better than I imagined. Stealing this idea soon! Every occasion needs an invite - so glad you like ladies! Elena - yes these are the ones I tweeted ages ago.